In January, I’m doing four performances of my one-woman show “My Studio” at the Broadway Palm Dinner Theatre. 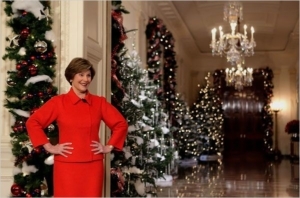 That got me thinking about what I’m going to wear, which in turn reminded me of the time I met First Lady Laura Bush at an artist’s reception she hosted in the Blue Room at the White House during her husband’s administration. It was a party for the 250 artists who’d created Christmas ornaments for the White House Christmas Tree. I was one of them. 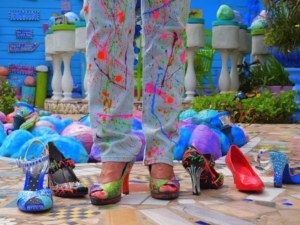 In my inimitable style, I painted an outfit to wear to the event, right down to my heels. When Mrs. Bush admired them, I promised to send her a pair, but I could never seem to get her shoe size. 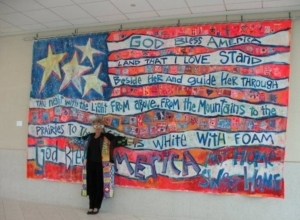 But then her office called me in June of 2011 to say that the former First Lady wouldn’t be able to attend a reception I’d invited her to at Southwest Florida International Airport for my painting Remember 9-11. While I had her scheduler on the line (a nice young lady by the name of Anne), I remembered the shoes and persuaded her to give me Mrs. Bush’s shoe size. I always keep my promises. But this one took nearly 4 years to fulfill! BTW, here’s the link to a short 1:31 minute YouTube video showing me, my outfit and ornament at the White House party in 2003.